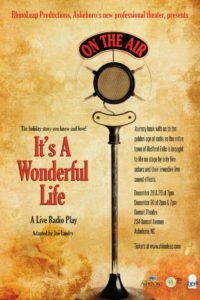 Our friends at RhinoLeap Productions are putting on “It’s a Wonderful Life” at the Sunset Theatre at the end of December. Those of you who were involved in our Summer Camp will recognize some familiar faces in this performance. Please support those groups and individuals who have helped us! Also, RhinoLeap will give 20 percent of all tickets purchased through RYTC back to us. So, it’s a great deal all the way around. In addition to what’s listed below, there are two other options available. First is admission to an Opening Night Gala at 5:30 p.m. Tickets to the Gala come along with tickets to the show for $50. Also available is a Family Pack of six tickets for $90. These tickets can be used for any age. Order this Family Pack through the ticketing website Brown Paper Tickets. 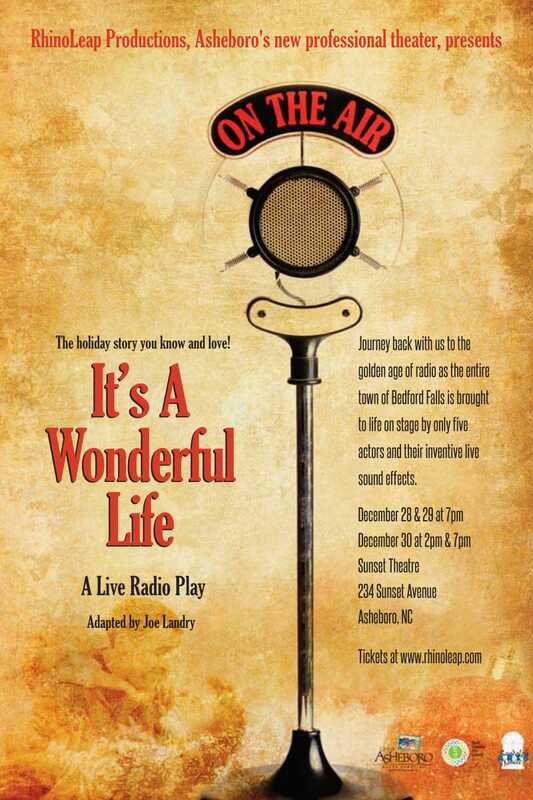 December 28 & 29 at 7 p.m.
December 30 at 2 and 7 p.m.
All performances are at the Sunset Theatre, 234 Sunset Avenue, Downtown Asheboro, N.C.
Click here for a printable PDF of the Ticket Form that lists RYTC as your organization to bring with you to the box office so that our group gets 20 percent of your ticket price.